The rise in digital marketing has created a wealth of opportunities in engaging with the customer and disrupting traditional organisational structures. At the same time, it has removed barriers to entry into a number of sectors where a start-up, sole trader or large corporation is now competing with one another globally. Digital has driven organisations to become more customer-centric i.e. putting the customer at the centre of the conversation whether your a start-up or an established global organisation. For example, take online retailing: A recent article from internet retailing reported that in the UK, shoppers spent £5.8bn online in March, a rise of 14% compared to the same time last year and this is within the retail sector, a sector that has taken a pounding within the current economic climate, witnessed by the closure of many established high street chains. The chart above details the % of total sales that came from online in 2011 with the UK achieving 12%. For marketers and businesses alike, goal posts are moving and the rise in digital marketing is changing the business landscape, this means embracing new business models, understanding new marketing tactics and changing the business mindset (e.g. not being afraid to trial out and fail on new strategies to connect to your customer, or prospect or community and more importantly having the right qualifications and digital marketing expertise to embrace this new world). Digital is now default within organisations looking to progess and survive within their respective verticals and in turn has meant a digital marketing team provided the foundation to remove company silos. There is a distinct lack of digital marketing “qualifications” to support the growth within universities, colleges and schools, all not offering academic options that are aligned to digital for students wanting to specialise in digital communications and marketing (e.g. social media, affiliate marketing, search engine optimisation). Digital marketing is still not on the list of primary or secondary curriculum subjects. Likewise for higher education digital marketing courses, a lack of suitable qualifications that are solely focused on digital marketing. Until higher and further education embrace qualifications to satisfy would-be digital marketers, it is up to organisations to ensure they provide suitable framework for their digital staff that provides the necessary training and ensures the business itself is hiring the correct staff and is providing the right opportunities to embrace digital skills. A recommended framework could be applied within any business that is looking to recruit and develop their digital marketing team, to make sure they are hiring for the right blend of skills. This was taken from a book called Inbound Marketing by Halligan & Shah, and is called the DARC framework. 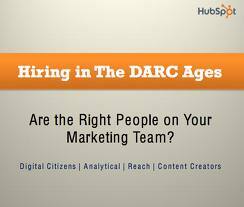 D – Hire Digital Citizens – People that can understand the online environment and can display a working knowledge. It is important your team and individuals can understand digital tactics and can display examples. This doesn’t mean having a Facebook account and tweeting random comments but they’re are using digital to support their own interests and hobbies e.g. can demonstrate they have their own blog, they have edited, created and posted videos on YouTube. A – Hire for Analytics – Understanding of digital trends and have a curious and analytical approach to what impacts product sales or why there has been an increase in traffic levels to a specific web page. They should also have a good understanding of spread-sheets and be able to interpret trends. C – Hire Content Creators – The importance of good content on a website can be a key USP over your competition so look to hire someone with good writing skills and more importantly can write for the web to engage with users. The internet has removed the barriers to creating content, anyone can now create content and publish it to the world. The skill is not necessarily writing content but how your content can stand out from the crowd, what USP can you offer that no one else can and more importantly can you create your own niche? This entry was posted in Digital Marketing, Digital Teams. Bookmark the permalink. Thanks for posting and sharing the DARC framework. Re structuring the marketing activity for the post-digital age is one of the things we help SMEs in the south west to do. What has been your own experience of a) how successfully businesses make this shift and b) the biggest challenges they will have to confront going forward (in the south west)? Interesting points you make, in my time working within digital marketing, I’ve found it’s making sure you have attracted and work with the type of person that wants to embrace new digital technologies i.e. who is prepared to ask questions, who is not afraid to fail at something new and also, has a creative and collaborative willingness to embrace digital tactics. For a business to succeed, they too need to have a flexible, collaborative and innovative approach within its fabric/culture to want to embrace digital, this is not just important to help the business evolve but also to retain their staff and provide the necessary challenges. The South West is blessed with a number of start-up organisations as well as large businesses who provide opportunities for digital to be embraced in how they communicate to customers as well market their services & products. The willingness to continue to push the barriers, to test the status quo and not being afraid of failure is the recipe to a success in embedding a digital framework. Think this model is a really useful one Simon. We seem to have forgotten how important recruitment is in the digital age. For me its about hiring people who understand emotional intelligence, community, collaboration and content as you point out. Our leaders of the future need an in depth understanding of these key issues. One thing I would emphasise more in the DARC model is the need for publishing skills in the ‘C’ section. Its not just about writing skills but editing and publishing. Constructing sentences in a highly readable way and pushing content to the next level. Thanks for the finding the time to reply. Couldn’t agree with you more. We live in a world of niches and specialism now. Its not about too much content but our ability to filter and curate not just using algorithms but by humans curating information and turning that into knowledge.